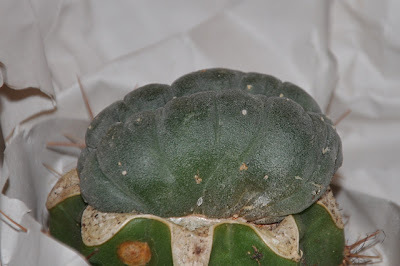 I must admit to not being particularly well-versed in Trichocereus/Echinopsis, and just went with the description from Cactus Plaza saying: "crested Lophophora [...] (grafted on Trichocereus pachanoi)." If not T. pachanoi, any suggestions for what the stock plant might be then? I'd say it looks more like Trichocereus terscheckii or T. peruvianus than a T. pachanoi, but it's hard to tell. I see what you are saying. The spination of my stock plant looks a lot like the Trichocereus terscheckii pictures I have found, but as you say it's hard to tell exactly. Someone gave me a T. pachanoi some years ago, and the plant is actually spineless. 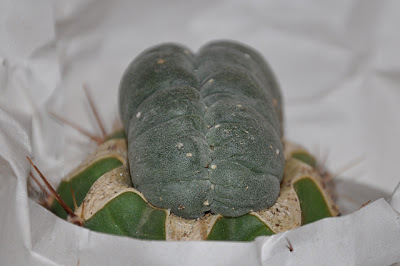 Then, I bought some T. pachanoi and T. peruvianus seeds with Köhres. After the years, and after repotting them many times, I got them mixed up and now I don't know which one is which, but they really look almost the same... and all of them have very long spines. Trichocereus pachanoi will always have short spines. Trichocereus peruvianus will always have longer spines. I'm sure this L. is grafted on Echinopsis. Look at the bal shape of stock. Trichocereus'es are column shape. It's hard to say what species of Echinopsis is it. But my friend, who is specializing in the genus Lobivia, said that kind of Echinopsis stocks are from the group of eyriesii/obrepanta/sth I don't remember. If You want images or more info, write me please. Do you plan to take off the graft and root it properly? 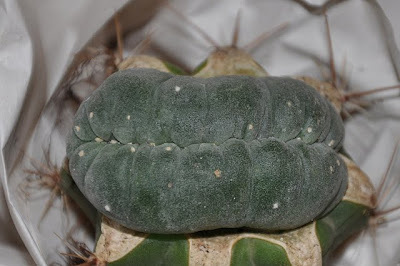 It seems like Trichocereus/Echinopsis taxonomy is just as complex and fascinating as that of the Lophophora genus ;-) For now I'll probably just change the label of my Lophophora williamsii f. cristata to say that it is grafted on Trichocereus/Echinopsis sp. stock. mateusz I don't have your email address but if you (or anybody else) have photos or other information to share you can reach me at "lophophora (dot) blog (at) gmail (dot) com". Mouldfish, I'll leave the crest grafted, at least for a while. If it turns bloated I might consider de-grafting it. I would DEF. leave it grafted, forever. I hope it's OK to post a comment here requesting advice about grafting. 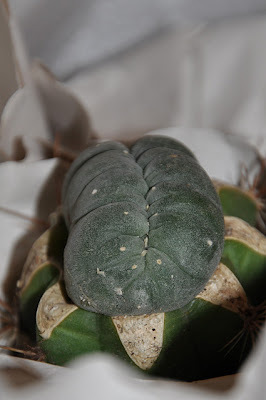 I'm new to this lophophora business, I only have a couple of plants I bought already grafted. Now I'd like to try my hand at growing some seedlings and grafting myself. How about the grafting stock? I've read good things about selenicereus, trichocereus, pereskiopsis and myrtillocactus geometrizans and I don't know which one I should pick. Do you have any suggestions as to the pros and cons of these species, or pointers to online info? Should I look for cuttings or can I grow rootstock from seed? By the way, thanks for sharing. This blog is both entertaining and informative! 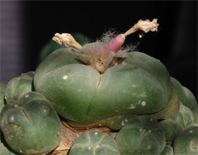 Personally I prefer Trichocereus species for grafting as they are fast and easy to grow, supply long-lived stock plants, and their slightly sticky sap makes them perfect for grafting. Myrtillocactus geometrizans is also often used as a grafting stock, but I don't have much experience with this species. Pereskiopsis spathulata is a good choice if you want to boost seedling growth, but don't expect Pereskiopsis stock plants to last for more than a few years. For cold hardy stock plants, Opuntia compressa is a choice species. 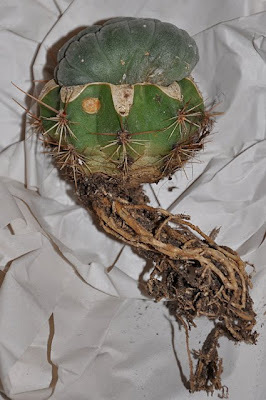 If you want to fast track it, you'll go for cuttings - but growing root stock from seed is a both soothing and rewarding experience (as always with cacti ;-) The majority of my stock plants were started as cuttings. You can find more information on various grafting stock plants here and good information on grafting in general here and here. thats pretty cool plant to add. Note the rounded root section , and the spination is that of Echinopsis. These are used alot overseas ( mainly commercial Asian growers) cause they boom scion growth , can be grown low to the surface, and have a wider vascular ring -perfect for grafting crest and tuberous plants.Not to mention , Echinopsis grown in nursery trade are pretty hardy to cold/hot temps and high humidity ..Plants harden well using Echinopsis as stock.